Thanks from Timothy C. Gogan, D.D.S. Thank you for the great presentation. I really enjoyed it! 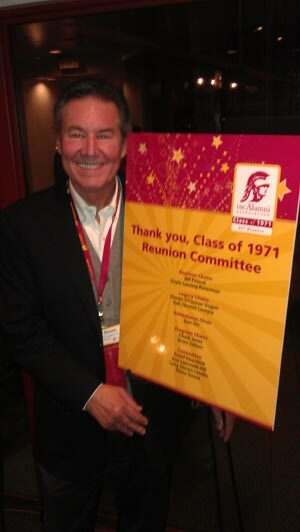 It has been such a pleasure to work with you on all of the many Loyola High Reunions, including the 50th this year. Thank you for all you did to help make our 50th reunion weekend very special. How does your USC experience impact your life today? USC prepared me for the future. I learned the importance of accuracy, research, and the fine art of communication. The lessons I learned were all practical. The people that I met during my Annenberg days became colleagues in the business. I discovered my career path through an internship at the Career Fair. Through hard work and applying the knowledge that I gained from the Annenberg Communication Management program, I was able to rise through the ranks at CBS to have an impactful, fun, and meaningful career. 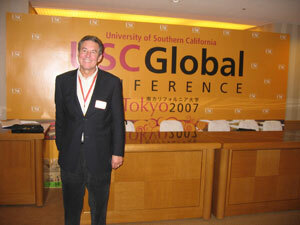 Have there been USC faculty, staff, alumni who have helped you along the way since graduation? 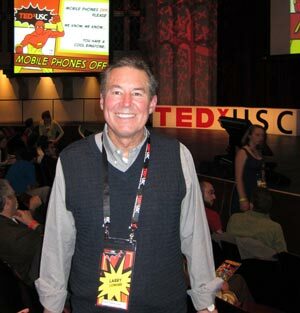 Larry Londre helped me hone my interests in Marketing and learn key theories. Thank you very much for attending, participating, and presenting. You did a fantastic job! Everyone was very impressed with you and your high level of expertise in Advertising and Marketing. Joseph R. Landolph, Jr., Ph. D.
I wanted to take a moment to thank your for your participation and contribution to the UCLA Advertising and e-Commerce Law Program this past fall semester. The generosity of your time helped make the class a great success. I certainly understand how busy you are and am grateful and appreciative of your assistance. 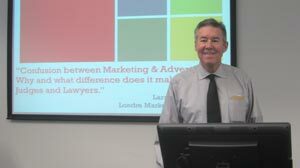 Thank you for your wonderful “Confusion between Marketing & Advertising: Why and what difference does it make to Judges and Lawyers” presentation for CLE credit yesterday. It was well-received by our alumni. Thank you for coming in to speak at Marshall about marketing and on Entrepreneurship. Sometimes I fail to realize that the backbone of entrepreneurship is marketing, so it was nice to have an individual of your extensive background come in. With the lessons that you have taught us today, I will be better able to serve my team members and accomplish my goals. There were a couple of key lessons that I took away from your time. The first was that nothing arouses attention at a meeting like free candy, especially chocolate. Next, never underestimate the power of free in your own marketing capabilities. If you can act as a middleman between the companies who are marketing to you and who you are marketing to, you can incur the benefits of free marketing. Last, never underestimate the importance of finding the right target market, because so many businesses never actually do. In entrepreneurship, it seems as though the only thing that stays constant is change. 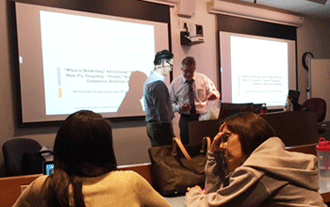 My name is Michael Chung and I wanted to thank you for coming to our class last week in Professor Henry’s class. Learning about marketing from an expert like you was incredibly insightful. I learned the importance of targeting and not aimlessly trying to get our product out there! My biggest take away from your presentation was when you told us to have a sense of urgency when doing business. When dealing with suppliers or vendors, it is best to under promise and over deliver to keep our credibility as a business. Also, Thomas Jefferson’s quote that “I am a great believer in luck, and I find the harder I work, the more I have of it,” really stood out to me. We need to work hard to find ourselves more luck! I feel privileged to have feedback from you for our CloveLA concept. I still remember what you said about how our business decisions should either build revenue or cut costs. It’s as simple as that. Further, in every team experience I am building my brand so I will also keep that in mind. Thank you again for your time and thank you for your candle purchase. I hope your family really enjoys it! Thank you so much for coming to speak with the seniors yesterday. I spoke to a few of the seniors after you left and they had nothing but positive feedback. They were really thinking about the good and bad ads and the connection between art work and copy. I think it really helped them put in their mindset about what they did need to think about as we set out on this project. They are creating their initial creative briefs and beginning the research this coming week. We will invite you to the final presentations at Ignited at the end of April, 2014. Thanks again for all your effort and support for CSUN AMA! Everyone learned a lot from the “Getting an Interview. Landing a Job. 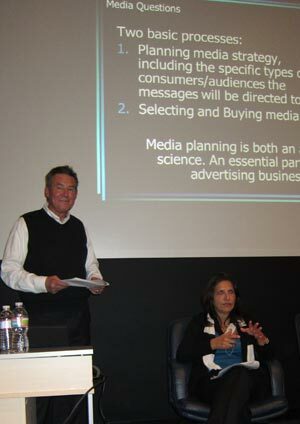 Practical, Insightful, Timely Advice and Counsel for the AMA at CSUN.” panel and we received really great feedback. Thanks so much also for bringing in Cathie Kanuit and Lynnette Ward – you were all fantastic! Thank you for taking the time out of your day to come and speak to our members at the American Marketing Association at CSUN. We learned and gained much Marketing knowledge from everything you had to teach us. Your enthusiasm and passion for marketing plus your Nine 9’s which encouraged us. We hope to continue and grow this friendship between the American Marketing Association (AMA) and you! Thank you again and Best of Luck with your future endeavours. Looking forward to keeping in touch. We will have you back in February for the Jobs Seminar. In the three years I was an undergrad at USC, I occasionally had a class that I thoroughly enjoyed – not because it was simple, but because the professor taught it so well and genuinely inspired me. At such times, I often wished to express this to them: to let them know that their efforts were appreciated, to affirm they were doing a great job (from the perspective of an interested student). However, I could never find a moment at which this would be appropriate. It would be inappropriate to do this at the end of class or at the end of the exam, as this could be considered an attempt to get in their good favor simply to get a better grade. Putting it on a student evaluation would not seem to do a lot of good either, as these are held from six months to a year after the course has ended. And to bring it up in conversation or mail with them even later, months after the course has ended…seemed rather odd, as well. It’s been two years since I took your Spring 2010 Intro to Advertising course at Annenberg, and I find myself more grateful than ever for the lessons you taught me. I want to take this opportunity to finally thank you. I am currently the Content Manager for Sprouts Farmers Market, a fast-growing corporation in Phoenix, Arizona. My role is to develop the messaging and voice of the brand. I was recently charged with researching the company’s target market, key consumer insights and competition. I have created half a dozen promotions in just a few short months. And last week alone, I wrote 10 radio spots for three different markets. As you can see, I have been reminded of the many days and nights I spent working to rebrand Jello. Thank you for teaching real-world actions, theories and concepts. The breadth of knowledge I attained from your class has allowed me to tackle a variety of projects with confidence and great success. Thank you again for all of the wonderful work you do. Thank you again, Larry, for an amazing class. I loved every minute of it and will (and already have!) recommend it to all of my friends who are even remotely interested in Advertising and Marketing. I came in an undecided Freshman, and now I am leaving your class knowing for certain that I would like to pursue a minor in Advertising and possibly transfer to the business school to study marketing. So I just wanted to let you know that this class had a profound effect on me, and I appreciate all you have done for us. Thank you! I hope that you have had a great summer and that this message finds you in good health and high spirits. I have spent the summer delving into a new internship with Disney’s Cable Networks Group. I was at ABC for 2 years doing quantitative research; but, I made the decision to hop over to qualitative work with focus groups and survey testing at Disney and I love it! The department is under the Research umbrella, but more specifically Brand, Strategy, and Marketing Research. I’m so thankful for 340, as I have definitely been about to keep up with any marketing lingo thrown my way and have creative insights to offer about our advertising strategies. So thank you for that! I still give an hour speech to anyone who asks me about taking your class - it is STILL my absolute favorite class at SC. Thank you for a GREAT marketing class!! All speakers were a great addition to our marketing class. The speakers yesterday have made us more knowledgeable on behavior at interviews and on writing resumes. This process is definitely important because it’s our chance to make a first impression to the job we are applying for and we know we can never get a 2nd chance to make another first impression! We wanted to let you know that it’s sad that the semester is already coming to an end next week and we also wanted to say that this class was a great experience for all of us! You’ve been wonderful as our teacher and we hope you have an AWESOME summer this year! My name is Matthew Campos. I re-introduced myself to you last night at the LA Film Festival Opening Night Gala. I just wanted to say it was a pleasure seeing you again and that your class (CSUN MKT 304) pretty much taught me and exposed me to the most important aspects I have encountered in my young marketing career. I currently am employed by the Los Angeles Times and conducted my last ad sales project in Westwood (The LA Film Festival). I remember you speaking of your level of involvement with the Westwood community; hence the reason I probably saw you last night. I do not want to take up too much time in your busy day, but I just wanted to extend my gratitude for the many lessons you taught in your class. I still distinctly remember Mr. Rob Allen (HONDA USA) who came to speak (I even wrote and email to you last year regarding his lecture) and your other colleagues (one from Sit N Sleep, Disney, and the other from SCBA, radio ad sales). Those guest speakers were a real inspiration and great insight into the “real” world. Thanks so much for sharing your great work and expertise; I hope to keep in touch and hear from you soon. Larry Londre’s JOUR 340 class has been the most memorable class I have taken during my three years at USC. He is incredibly knowledgeable and deeply cares for the well-being and education of his students. His connections in the real world enhance his students’ learning experience; he brings in multiple guest speakers every week and sets up agency tours throughout the semester to give us an opportunity to learn beyond the textbook. It is rare to find a professor who puts in as much time, energy and compassion into teaching as Larry Londre does. If Professor Londre were not to return next semester, he will truly be missed and his absence will be felt at the Annenberg School. Throughout the semester, I have strongly recommended his course to my peers and spoken highly of him to my classmates. I do hope you will take my words into consideration. I speak on behalf of my entire JOUR 340 class — Larry Londre is a brilliant, experienced professor of Advertising and I am honored to have taken his class. Thank you so much for your comments and praise, I am so proud of my team too. We came a very long way. I can honestly say I learned more practical applicable knowledge in your class than almost any other at USC, so thank you very much for that. I know I will use what I’ve learned in whatever job I end up pursuing in whatever industry I end up selecting. If there is anything I can do to help please let me know. I am writing to bring to your attention Larry Steven Londre, a professor under whom I recently had the pleasure of studying while a student in Communications 541: Integrated Communication Strategies. While I have known Larry for only a short time, I have been tremendously impressed by him. A professor in every meaning of the word, Larry is honest, fair, and genuine in his role as an educator. He exhibits extraordinary organizational and leadership abilities and has boundless energy and infectious enthusiasm. 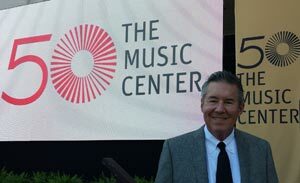 Larry has developed a syllabus, curriculum, and course materials, recruited and coordinated an array of guest speakers, and directed classroom discussions that encapsulate a truly unique experience for his students. Dr. Riley, I hope the information above helps to describe what an amazing asset Larry is to your school. Educators like him reinforce the prestige of Annenberg’s graduate programs. “Londre’s JOUR 340 was not just a class. It provided real life experience and examples that tested our creativity and our ability to work in teams. 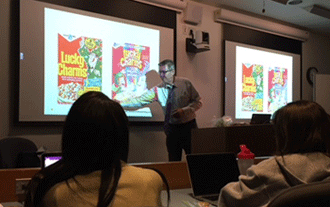 The class allowed the synchrony between contemporary advertising and a student’s progressive way of thinking. It challenged students to look at past and present ways of advertising, and attempting to come up with their own solutions to the changing and fast-paced structure of the world of advertising. It was as though an agency’s thought, creativity, and processes were brought into the classroom, for students to analyze and create their own magic. By working in teams to come up with creative solutions, students were taken through the process of what it takes to create an advertising campaign—from start to the final product. I am thankful that you were my strategy teacher. I definitely appreciated the classes and the challenge of the assignments. There were a lot of ways to approach them — a minimalist approach worked for some. For me, I enjoyed digging in past the basic material to find current information which went past the basic case studies. Also, I loved the perspectives that you shared and really appreciated the speaker from Disney. Great perspectives. I hope Pepperdine maintained a reasonable balance of real world professionals on their part time staff and didn’t swing too far into using the full timers. Anyway, best of luck to you in all you do. Aside from being what can only be called a marketing and advertising expert, Larry is nothing short of a stellar teacher. He ably combines a love of the subject matter with sincere concern for his students into a class that is nothing short of inspirational. Students leave his tutelage with more than a grasp of skills and concepts; they leave with passion and an understanding of the bigger picture. “Larry’s class is one of the best classes I’ve had, and it was great having Larry as a professor. When we started the class I was unsure what career I was going to go into. After taking Larry’s class, I know that I want to go into advertisement. If you’re unsure about what classes to take at USC, Larry’s class is definitely a must. It’s strange how the semester went by so quickly, but thank you for making this class as awesome as possible for us! I think our whole class really appreciates all of your time and effort you put into making this class worthwhile and valuable. All of the guest speakers were great, and thank you for your efforts to bring those speakers in and arranging all the trips to the agencies. I wish I could thank all of the professionals who came into class again because they gave such great insight about their work and life in general. Also, I appreciated how they were willing to sacrifice their time to speak to us and look and critique the campaign that we had been working on throughout the semester. I must admit that there was a lot of work required for creating this campaign, but after seeing all the completed works today in class, it was definitely worth it. Thank you again, and I hope you have a great rest of the year! Last semester I had the privilege to have you as my professor in the Integrated Marketing Communications class (440) at California State University Northridge. I truly feel that your guidance from day one, the class assignments, tests and team project of creating the advertising plan along with the creative for Mountain Dew Code Red, gave me a most clear picture to effectively start my career in advertising. I also want to thank you for the time you took to help me with the job hunting process, and the generous letter of recommendation you were nice enough to send my way. I feel blessed to have gotten a position as an Advertising Account Coordinator for Anita Santiago Advertising Inc., based in Santa Monica; I start February the 11th 2002. I will keep in contact with you and let you know of my progress. On behalf of myself and my co-instructor, Michael Puopolo, please let me take this opportunity to express belated but heartfelt thanks for your participation in our UCLA course last spring semester. The generosity of your time in presenting the Nine P’s and examples of the confusion between Marketing and Advertising helped make the class a great success, and your remarks were very much appreciated by the class! I know how busy you are, and am grateful you were able to carve out some time to speak with our students. Thank you so much. Please find enclosed a small token of our appreciation.